…It’s a must because every child needs to feel represented in storytelling. I’ve been trained to believe the point of being an actress is to create a connection with the audience. Meaning EVERYONE in the audience. When a person feels included or heard it helps them have more compassion to also want to help others to feel the same. We should feel curious and excited to learn about someone different than ourselves. As actors, we are given the opportunity to lead by example for inclusion in the stories we choose to tell. I never look at my characters as a color. I try and figure out what kind of person they are and want to help the audience feel everything about that character through my acting. I had the pleasure to interview Saniyya Sidney. 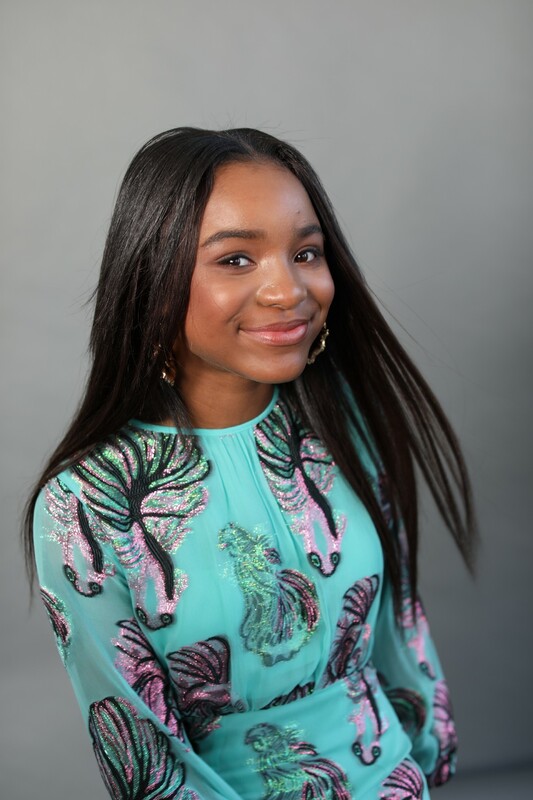 From a young age, destiny seemed to call upon Saniyya Sidney to work with some of the most respected actors and directors in the industry. Her first role was iconic. Filming five weeks in New Orleans, she played “Young Kizzy” in the new adaptation of Alex Haley’s “Roots.” She instantly bonded and formed an incredible artistic partnership with her director Mario Van Peeples. Next she was off to Atlanta on another historic project. Playing Taraji P. Henson’s daughter in the feature “Hidden Figures.” The film also stars Octavia Spencer and Kevin Costner. Taking place in the 1960’s, it tells true story of the three African American mathematicians who computed the trajectory for the first Apollo missions into space and moon landing. Next she received the call that can catapult the trajectory of a career. It was from Denzel Washington who cast her as his and Viola Davis’ daughter in the film “Fences.” Another period piece, this one taking place in the 1950’s. Mr. Washington directs the story adapted from the August Wilson play, in which he and Ms. Davis reprise their Tony winning roles. In 2016, she attended the Oscars for the first time for both “Hidden Figures” & “Fences.” The next person who knocked at the door was the incomparable Ridley Scott. Saniyya was cast in the lead of Amy Bellafonte in the series “The Passage.” It is a role that she will forever treasure. And is thrilled to be back with her FOX family. My home if full of love. Our family is extremely close. We support each other’s dreams and believe that it is important to let each other know that we care. With that love and support, you also are expected to give 100% in everything you do. Whatever gift you have been given by God is a gift that can’t be wasted. I’ve always known I wanted to be an actor. I watched tv and would memorize the roles of my favorite shows and then would act them out for my parents. When I was around 4 I began telling my parents I wanted to be on the shows. My mother saw me re-enact an entire scene from one of my shows by memory and told my dad we should explore this talent some more. So a week after my fifth birthday I began my first class. And I haven’t stopped working on my craft since. Ever since I was tiny, I watched the Oscars and dreamed of going. When I found out “Fences” and “Hidden Figures” both got nominated I just screamed. My first Oscars I got to go for two movies!!! I cannot wait to go back again! I learned not to judge from an audition if you booked the job or not. I really wanted to be in a comedy and I had a directors session to play Kevin Hart’s daughter. I wanted this role very badly. I didn’t even get through the entire scene when the director said “thank you!” and I left. He didn’t even give me direction. My dad walked me out and could barely get me to the car when I started crying so hard. I knew I didn’t get it. Before we even made it to the freeway, my manager called and said I booked it! It taught me to always just stay focused on the work, and the rest always works out some way in your favor. By the way, that movie just released on Netflix “Kevin Hart’s Guide to Black History! My wonderful series “The Passage.” I play Amy Bellafonte. It’s been a role I will love the rest of my life. The show is filled with scary viral creatures, scientific experiments & the end of the world. At its heart is the relationship between a girl who has no father & a man who lost his daughter. Amy is courageous, funny & always puts loyalty before fear. I also have a great movie called “Fast Color” coming out in March. Incredible all women leads & directed by Julia Hart. It’s a must because every child needs to feel represented in storytelling. I’ve been trained to believe the point of being an actress is to create a connection with the audience. Meaning EVERYONE in the audience. When a person feels included or heard it helps them have more compassion to also want to help others to feel the same. We should feel curious and excited to learn about someone different than ourselves. As actors, we are given the opportunity to lead by example for inclusion in the stories we choose to tell. I never look at my characters as a color. I try and figure out what kind of person they are and want to help the audience feel everything about that character through my acting. My series “The Passage” was taken from a very popular novel written by the amazing Justin Cronin. My character, Amy, in the book is white with red hair and freckles. But when I auditioned, FOX & Justin knew I was their Amy. I was hired months before anyone else. They said they knew the second I walked in the door I was born to play this role. So from my experience, I hope writers, producers, casting directors will cast roles with the heart of the character in mind, not the skin color. Go further to be more inclusive with all who work behind the scenes. Do more bio pics of great people who come from a culture or situation we haven’t seen before. 1. Acting isn’t a destination it’s a journey. Denzel Washington told me to always “Seek the Truth.” Finding the truth is endless. Which means you’re always learning. 2. Trust the timing. There have been jobs I have been up for, I really wanted at the time, but I didn’t get. Had I booked them, I would not have been available for an even more meaningful role that was on its way. 3. Your purpose is connected to your passion. Find the thing you love, I mean really love. That you can’t help but always push yourself to be better at it. 4. Doubt and dreams can’t ride together. Each will take down the other. 5. Be grateful and humble. To all who support you, your parents, friends, and team. An actor has never become successful alone and has to always remember that this can end at any moment, so have fun. I have a great “tribe” of actors, who really push each other in our craft & truly celebrate each other’s success. We always stay focused on doing great work. Do something good in the world. Keep a positive mind & stay surrounded by positive people. Laugh every single day and always make sure the people who love you know that you do. 40 days of kindness. I mean everywhere. Only positive comments on social media. Only nice things to say to or about other kids at school. Families talk to each other nicely. Teachers have patience with their students. People in cars can’t scream at each other. Kindness to all animals. Governments think about ALL the people in their countries in a nice way. It takes 40 days to break a habit or start something new. Can you imagine how the world could change if we all experienced 40 days of kindness? I can think of three. My mother and father have always had my back. Ever since they recognized that I had a passion for acting, they have sacrificed tremendously to help make my career happen. They have put a whole lot of miles on the freeway in LA traffic, slept and worked in their cars while I’m at acting class and auditions. Been there through all of the “no’s” when I was down and to celebrate the “yes’s” when great things happen. I am so grateful for them everyday. I love my mommy and daddy. I also have to thank my manager Constance Tillotson. She has been there since day 1 and has recognized my potential from the beginning. With her training and her guidance, I have had an incredible experience in this business and I am so grateful she is part of my life. Hesitation in life prevents us to fully live it. Beyonce!!! My older sister and I have been fans of Beyonce since I can even remember. She is the most incredible entertainer to me and I would love to meet her and just discuss with her how we girls run the world!! !